A survey of Chinese-trained nurses working in Australia has revealed some interesting insights into the role of nurses in the Chinese healthcare system. Three main themes emerge from the interviews with 28 Chinese nurses working in Australia carried out by Zhou Yunxian from the Zhejiang Chinese Medical University, Hangzhou. In Australia, Chinese nurses found they had more independence and responsibility than they did under China's more regimented and hierarchical hospital system. 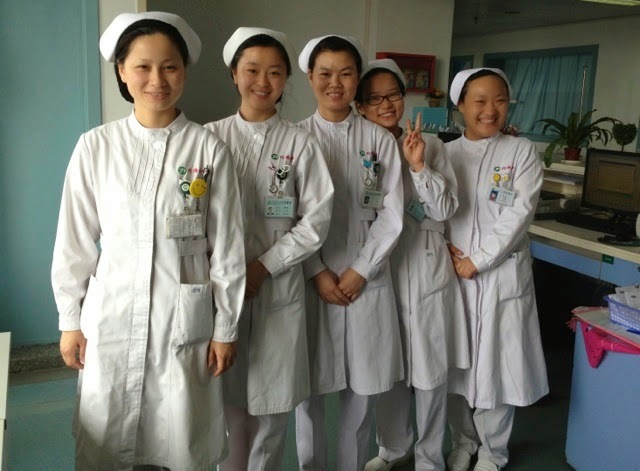 Chinese nurses said they felt uneasy about having to take the initiative in patient care rather than be given orders by a senior nurse or doctor. "Generally speaking, nurses here are more independent. They don’t rely on doctors totally. They can have their own thoughts and make decisions on the caring of patients," said one nurse. Demarcation of roles is obviously stronger in the Chinese system - the nurses working in Australia found it strange that there was open communication and equality between nurses and doctors in a western healthcare system. "I don’t know what they (local colleagues) are doing, chatting with doctors – a waste of time from my perspective," said one, who believed that nurses should concentrate on 'nurses work' and not get involved with doctors. Another theme that emerged was around the role of the nurse and their scope of practice. In China, nurses often saw themselves more as clerks and technicians fixing up IV lines rather than patient-oriented 'hands on' nurses. Chinese nurses were horrified to find that in Australian hospitals they were expected to do 'dirty' manual work such as bathing patients or helping to feed them. "I feel too embarrassed to tell people (the fact)…If I tell my family that a nurse in Australia needs to shower the patient, I think even my family would find it very hard to accept," said one. This revealed that in China, manual work in hospitals is done by unqualified low-status 'care assistants', and personal help with feeding, toileting and bedding is the responsibility of the patient's family, not the nursing staff. Nurses from China also found it hard to adjust to the notion of a family leaving the care of a relative to 'the system' rather than taking personal responsibility - especially with the elderly and the way they are left in nursing homes. A third theme that emerged was communication. In China, nurses expected to be given clear instructions about tasks from superiors, however they did not feel any obligation to communicate with patients or their families. 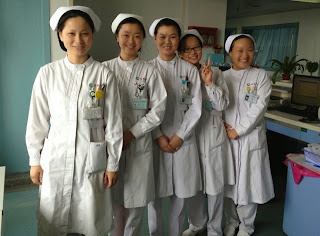 Chinese nurses were surprised to find that in western hospitals, nurses were expected to be friendly and personal with patients, who they regarded as strangers. "Here every nurse calls everyone 'sweetie', 'love', things like that. It is totally different from us… I have never thought of addressing a patient so intimately. It is hard for us because we don’t feel this way," said one nurse. Language and cultural differences also meant that Chinese nurses found their usual 'direct' style of communication appeared rude and imperious to westerners. They found it hard to be 'warm' and polite, believing this to be insincere. In contrast, Chinese nurses expected that their colleagues would become their workmates and were disappointed to find that westerners were out of the door at 5pm and not interested in networking. "Anyway, they (local colleagues) come when they are on duty and they leave when they finish the shift. In China, we are colleagues even after the work. We go out together, and then we become very good friends." • All accepted abstracts will be published in the supporting journals of the conference and Conference Book Proceedings. • Huge Benefits on Group Registration. • If you want to attend with your research group you can avail Group Discount. • Abstract page and speaker page will be created in Google on your name. • Live Streaming of your presentation through our websites and YouTube.